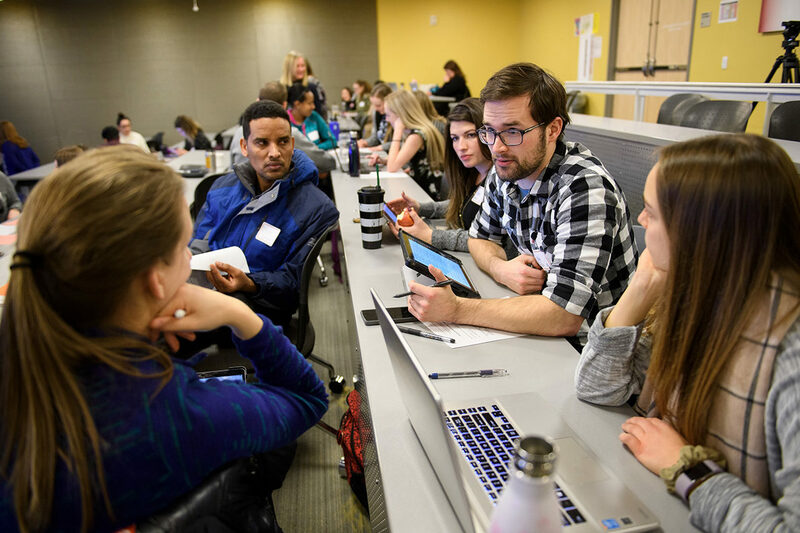 A new class at WSU Spokane teaches students a team approach to treating patients with opioid addiction. Soon it will be freely available online to any university wanting to offer the curriculum to its students. A follow-up grant also will adapt the material for use by rural health clinics. The curriculum was designed by Richardson, whose specialty is interprofessional communication; Marian Wilson, PhD, RN, an assistant professor in the College of Nursing who has done extensive research into opioid use and misuse; Brenda Bray, MPH, BPharm, an assessment specialist in the College of Medicine; and Connie Remsberg, PhD, PharmD, of the WSU College of Pharmacy and Pharmaceutical Sciences, where she leads efforts in advancement of teaching and learning excellence. Teams of at least four students – from nursing, pharmacy, medicine and either social work or chemical dependency – begin by talking about appropriate language. Richardson said patients who use opioids sometimes don’t seek care because they feel stigmatized. Next they talk about roles and responsibilities. If a nurse screens a patient and suspects possible opioid use disorder, the nurse needs to convey that information to other providers. If a patient’s spouse confesses concern to a pharmacist, the pharmacist likewise needs to pass along that information to the appropriate team members. Then the student teams tackle two fictitious, though typical, patient cases. One is a middle-aged man who has chronic back pain from a car wreck, the other is a pregnant female veteran who has chronic pain and PTSD related to her military service. The scenarios can be staged by actors, or the curriculum includes videos of the two sequences for students to watch. The teams confer about how to help these patients, and how to talk to patients about their opioid use. The Washington Department of Health asked Richardson to create the curriculum because of her success with a federal grant to teach students how to talk to patients about drinking and drug use. All of the Elson S. Floyd College of Medicine’s second-year medical students took part this year, as did all senior nursing students and third-year pharmacy students. Students studying social work and chemical dependency at Eastern Washington University also participated. The curriculum includes pre-reading, a guide for faculty facilitators and other materials. The WSU team will train facilitators in Yakima and Seattle and devise a way to make the curriculum widely available. They recently received additional funding from the Northwest Center for Public Health Practice that will allow them to adapt the curriculum for use in rural health care clinics. The WSU project team is seeking a graduate student to help with the project who has an interest in facilitating interprofessional experiences and/or about opioid use and pain care in rural clinics. The position will include about 8-10 paid hours for four to five weeks. Students who want independent study credits can work on the project for a longer time frame. For more information contact Marian Wilson at 509-324-7443 or marian.wilson@wsu.edu.